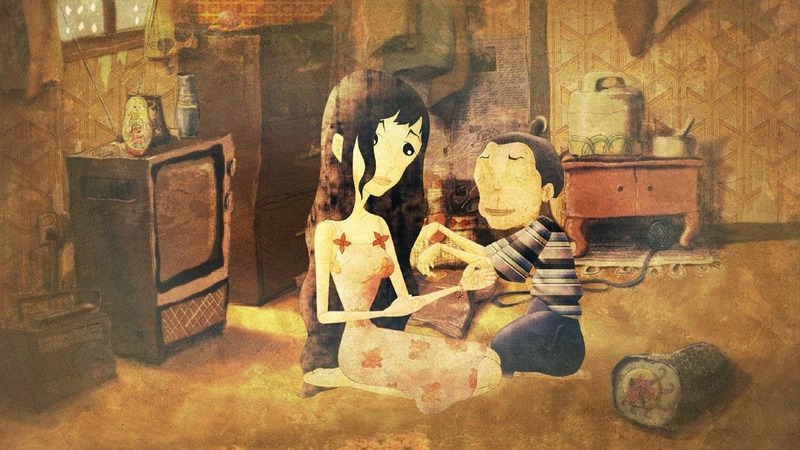 The Story of Mr Sorry, a 65 minute long South Korean animation, is a crude and ugly film. The elegant water-colours associated with Disney and traditional mainstream animation are eschewed in favour of a more blunt technique - a style which fits perfectly with this bizarre, unsettling and original, movie about an ear-cleaner, Mr Sorry, who is shrunk to the size of a spider. Yearning to learn the fate of his missing and fondly remembered sister (the only character animated with any sense of classic beauty), Mr Sorry (Eom Sang-hyeon) finds that his new diminutive size allows him to explore memories whilst inside peoples' ears - an array of surreal, disturbing and morose recollections, often stored deep in his clients' subconscious, lead him to an unexpected discovery. The Story of Mr Sorry - a dark, twisted tale - also inspires one of the more bleak questions proposed in art: does getting closer to others increase our empathy or our repulsion? Co-directed by five individuals (Korean Academy of Film Arts students Kim Il-hyun, Kwak In-Keun, Lee Eun-mi, Lee Hae-young and Ryu Ji-na), the film often feels disjointed and lacking, entirely, in lucidity and cohesiveness for large stretches. Whilst loosely a vulgar satire on Reality TV, showcasing our complicity in exploiting outcasts for novel entertainment, there appears to be little focus or spine holding the loose, putrid limbs of the film together. Perhaps, however, this is the point? Our nightmares, and the manner which the human mind whirs into cognition, rarely functions in the rational or with narrative sense. In this respect, The Story of Mr Story inventively takes us to places few movies would dare to tread. A potpourri of sickened, Freudian hallucinations, askew unsentimental nightmares, and putrid fever dreams unfold before our eyes - each uglier than the last, inspiring thoughts of sinister and uneasy repulsion. Yet, as we reach the end of the film, its not entirely clear why the filmmakers took us to the debased edges of the human condition. Perhaps the filmmakers are asking us to challenge ourselves: are we all complicit in the erosion of empathy in modern culture? Whatever the purpose, The Story of Mr Sorry is an uneven, albeit unique, sensory experiment which won't be to everyone's taste.